"Loving Lori's new CD. 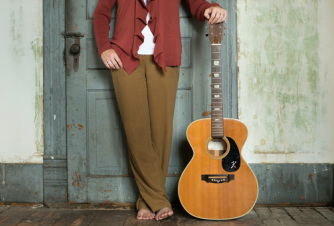 Her lyrics are full of honesty, wisdom, and hope- all communicated in the beauty of her amazing musical talent. I'm awestruck at her ability to vary musical style in the songs, while keeping the signature thread of her sound woven throughout. Nothing in this CD sounds 'forced' but flowing out of the depths of a heart that's 'been there'. Full of songs I want to sing along with and I find myself reflecting on the lyrics again and again. "'Rock of Ages, my sand has shifted...' It is as if Lori Sealy wrote 'Song of the Afflicted' with me in mind. I am moved by the honesty and hope conveyed in this song and in this entire project. Well done!" "It's like a taste of Karen Carpenter, with a touch of the Indigo Girls, all wrapped up in a package of sound and practical theology that drips of gospel grace. A Biblically grounded modern day masterpiece." "These songs really penetrate my soul!" "'Begone Unbelief' sings truth to my doubts, comfort to my fears, and grace to all the moments of this life. " and music that crosses all biases. "Thinking man's music - a rare thing to find these days. This project is solid on every front." and I am soothed in my storms. I am uplifted by this album. Sometimes every song on a CD can sound too similar, but Lori has put together a diverse musical experience." "Wow! Sat down yesterday and listened to 'Begone Unbelief' straight through with my eyes closed. and composition with the rest of us." "Lori Sealy is truly gifted in bringing the Scriptures to life through her music, and I am truly grateful." to the truths of these texts." "This CD speaks to my soul." "My sister purchased this CD for me and told me not to just listen once but to give it an honest shot. I have to admit, I was skeptical. I listened once. I listened again. I was moved! These songs sing God's Word into my heart during the day! When I am struggling or confused these songs speak God's truth into the situation. I feel like I have opened His Word and can feel His power coming over me." "Just sat down to listen to Lori Sealy's new CD, 'Begone Unbelief.' Absolutely love it! Songs of the spirit and heart rooted in Scripture." "Music that ministers the grace of our redeeming God, founded on the truth of God's written Word. Well done, and pleasing to the ear as well. " "Remarkable project. These songs minister to my inner man as few songs of modern making have." "I am absolutely amazed at Lori's spiritual insight, honesty, and talents and am truly blessed that she has shared them with us." and have promoted praise from me in my sufferings. What joy and freedom I have found through Lori's gift." "Really enjoying this CD. I get a great glimpse of Lori's heart, of my heart, and of all believers' hearts as we all struggle with our sin and take refuge in our gracious Father. Well done!" "Wow! Wow! Wow! Yep, that about sums it up!" "Lori Sealy combines solid truth with a sound that is as pleasing to the ear as it is to the soul." "This CD has blessed my soul. The songs and the way they are sung are powerful." my son (age 4) said, 'Ms. Lori sure does love Jesus a lot.' He can hear it in the songs. Thanks!" Christocentric songs that are pleasing to the ear, soothing to the soul, and engaging to the mind.